﻿ Carlton Hotel Singapore (Marina Bay) | FROM $139 - SAVE ON AGODA! "Fabulous adjoining rooms for our family, great location, clean and the most helpful and friendly staff." "Great location where it was located very near to mrt and shopping Malls." "Large spacious room with comfortable bed." For impeccable service and a lavish vacation, look no further than the Carlton Hotel Singapore. Rated 5 stars, this hotel is great for experiencing a truly lavish vacation. The rooms here look out over the city, giving you stunning views of the city. This hotel is near places of interest such as Artfolio Gallery, Chan Hampe Galleries, Bras Basah Complex, Ode To Art, and Mint Museum of Toys. 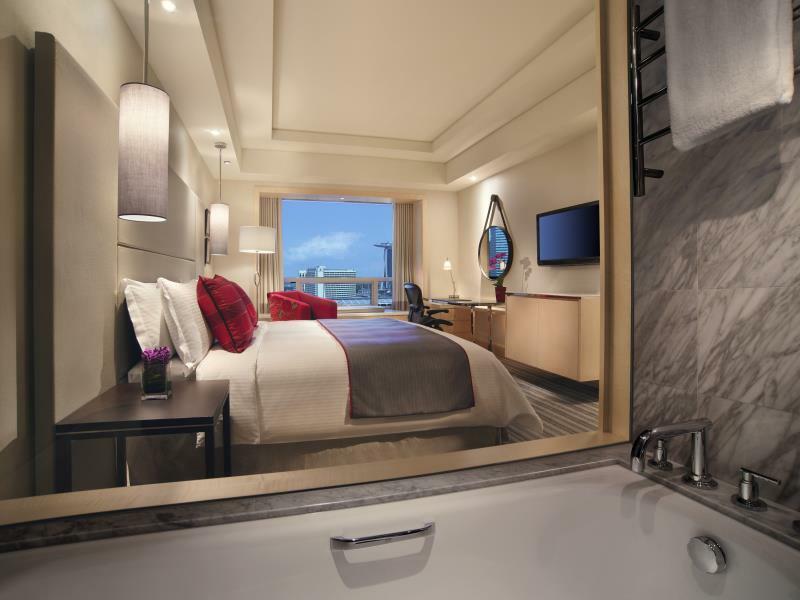 With an infirmary, a salon, a currency exchange, a laundromat, and shops, the Carlton Hotel Singapore has an assortment of convenient features to make your stay more comfortable. This hotel offers a variety of facilities for guests to make use of throughout their stay, such as a fitness center, a sauna, an outdoor swimming pool, a hot tub, and a spa. It has a kids club, offering parents a secure childcare option to keep their little ones entertained. Equipped with family rooms, it has ample space to sit together. The Carlton Hotel Singapore also provides a kids swimming pool to keep the children entertained during your time away. Whether it's a bar or a halal restaurant, it offers an assortment of dining and snacking choices for guests to enjoy. If you want to spend the day relaxing and unwinding, get a massage nearby. All of the rooms come with air conditioning, a hair dryer, satellite or cable channels, and an alarm clock. They also have an in-room safe box, a shower, bathrobes, slippers, and other amenities. The Carlton Hotel Singapore provides free Wi-Fi in all rooms, as well as Wi-Fi in common areas, ensuring that visitors are always able to contact their friends and family back home without overspending on international charges. The hotel provides a range of useful services, such as a concierge, daily housekeeping, and a babysitting service. With an around-the-clock front desk, it ensures that there is always a staff member on call to answer any questions at any time. It is pet-friendly, so you can take in your exciting new surroundings with your pet by your side. 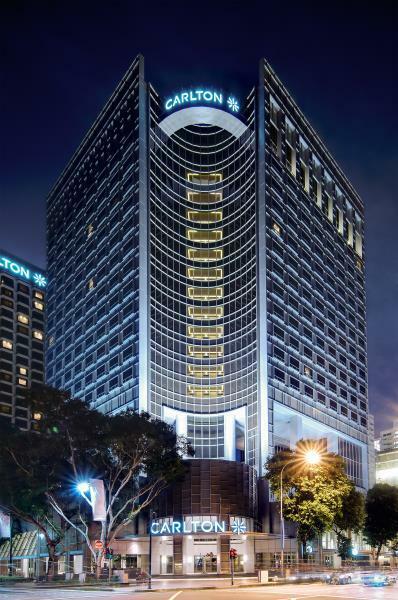 The Carlton Hotel Singapore offers check-in from 02:00 PM and check-out until 12:00 PM. This Singapore hotel provides a variety of transportation options, such as airport transfers and taxi services. City Hall MRT Station is 250 m away and Esplanade MRT Station is 320 m away. The nearest airports are Changi International Airport (SIN)-Singapore and Hang Nadim Airport (BTH)-Indonesia, which are situated 16.7 km and 34.4 km away. "Pros - modern clean rooms, attentive and accomodating staff." Please note that unaccompanied child check in age should be minimum 18 years old. Wi-Fi/Internet access is available only in certain areas of the property. Parking is available at no additional charge. Parking spaces are limited to one per room. Additional spaces will incur additional charges. Hotel club lounges are reserved for guests age 17 years and older during evening cocktail hours. Dress code is smart casual and slippers, flip flops, tank tops, bathrobes, singlets, and gym gear are not permitted. I think the price is fair. Service and location is excellent, the room is a bit small but got everything you need. Facilities are standard, but it is a strategic location to anywhere so if you feel like your schedule are packed and you are only to stay at the hotel at night time then this is a good option to stay. Good location.... walking distance to several attractions, if you opt not to walk it is very close to MRT. Food options around the area - from hawker to high-end restaurants. Good location for night out. Nice hotel, clean room, Reception Staff could be more friendly. Concierge Staff is excellent. Overall, we recommend this hotel....one of the nicest hotel. There is nothing to complain about this hotel. From booking, check in / check out, room condition and amenities to staff friendliness, all are smooth and satisfactory. Location is also one of the best in Singapore. Highly recommended for all kinds of travellers. Good location, friendly staff and very comfortable stay. Enjoyed my stay. Would recommend. The hotel is locate near shopping mall and I sleep very well and I like the cleanliness of the room. But the bad things is the open concept of the bath and toilet room. No door to lock. I think the room is design for couples instead of family. But overall I like it very much so will book for my next trip with the hotel. Great location and great hotel. The pool is very cold, so be advised if you have young children. Additionally, if you are a smoker, the hotel has no smoking areas at the hotel only outside on the pavement. Its easy to get around singapore but its more comfortable getting around if you are in the centre of almost everything. Carlton is one of those hotel which is located in the centre of mostly everything. Easy MRT and bus stops, a good variety of food establishments to choose from and a relaxing atmosphere in a vicinity that has almost everything you need. Location is excellent. Walking distance to shopping malls. Room is spacious. Breakfast not much choices. Call the reception to request slightly later check out time but no one pick up the call after many attempts. Meant to be a bday staycation, but staffs are not attentive enough to at least wish their guest happy bday. A bit disappointed. The hotel was giving out 2 hotel room card keys to guest. 1 to access the elevators and the other for the room. Both keys looked identical with no label to differentiate them. Some elevators could not recognise the cards, so we had trouble accessing our room level. The room power slot could only support 1 of the cards but we kept slotting in the incorrect one because there was no indication on the card itself. It's frustrating. Please come up with a better system Carlton Hotel. We enjoyed our 2 nights stayed. All the hotel staff are very friendly & helpful. The room is spacious and clean. Overall, they have excellent service, especially staff from the Premier Club Lounge. Will definitely come back and stay again in future. Location was excellent. Food can be found opposite the hotel and its in the center of city hall, bugis, dhoby ghaut MRT. Bathroom is a rather open concept with no doors into the bathroom. Only a glass door separates the showers and toilet bowl from the outside. Carpet was very dusty. Staff are polite and responsive. Visit there in my birthday and they gave a birthday cake in early morning. We can see Marina Bay from our window. Walking distance to Raffles city Mall and Cityhall MRT. Also bus stop station right infront of hotel. Always love this hotel because easy access to raffless mall, chijmes with many good restaurant & place to hang out, walking distance to bugis junction & china town. Just across the traffic light for MRT. Best location to go anywhere & if you like to try many kind of food, carlton is a walking distance to get all kind of resturants.